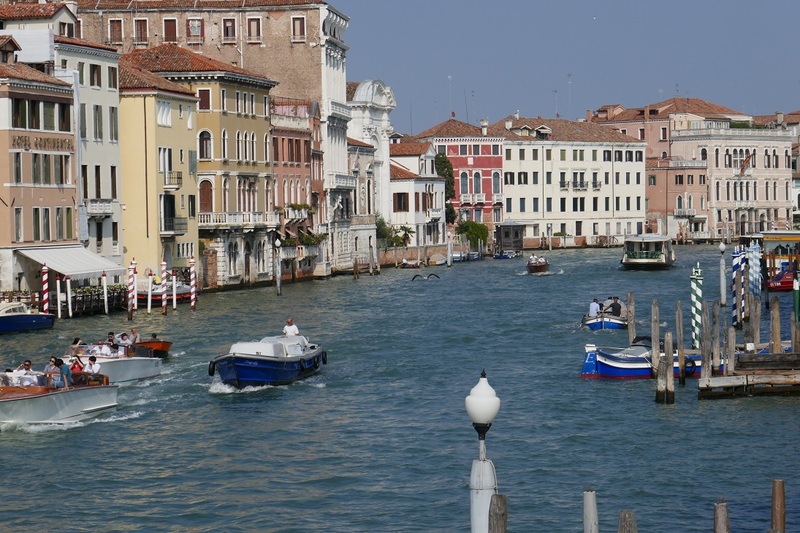 There are many cities around the globe that either have the word “Venice” as part of their actual name or use it in an effort to attract tourists. In that second category we have several listed as the Venice of the North, including the Netherlands’ Amsterdam, Brugge, Belgium, and Manchester, England. To the west in Ireland are Shannon and Monasterevin and to our south is Aveiro, Portugal and Empuriabrava, Spain. Not to be left out, France has Nante, Sète, Annecy plus Colmar and to the east across the border is Bamberg, Germany. We’ve been lucky enough to travel to almost all of those places and when we lived in Los Angeles, a short bus ride took us to the beach at Venice and on the opposite coast we even had Venice, Florida on our list of possible retirement spots. There are apparently 11 cities with that name in the US but Italy has only one and it was time to see the “real” one. Our train from Italy’s Mediterranean coast across the top of the country to the Adriatic Sea took only about 4 hours in travel time with a change in Milan. From the station to our apartment we were going to take a water bus called a vaporetto for €7,50 each. Instead of waiting for the next departure we walked using some of the 400 foot bridges over the network of 170 canals. Our accommodations were only a 5-minute walk from the bridge that was once the only one to cross this wide waterway. 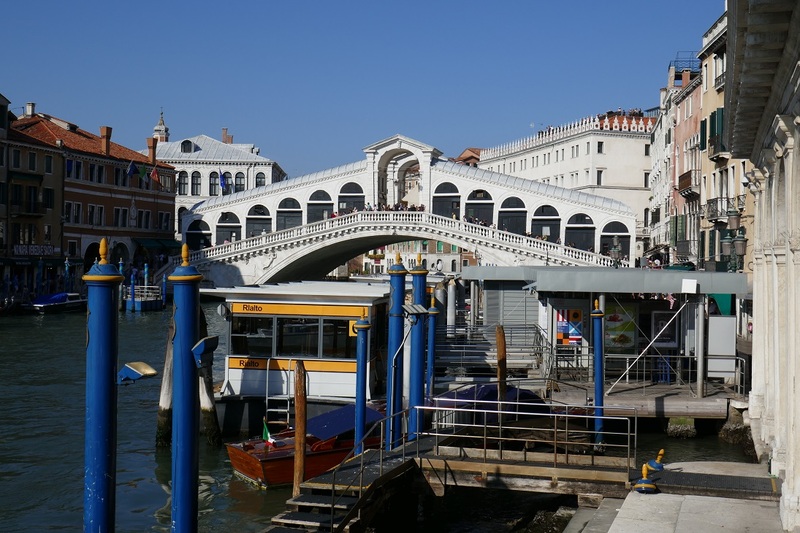 The Rialto Bridge, from 1588, replaced a wooden version that had collapsed 150 years earlier. Now this stone structure supports three pedestrian walkways lined with shops vying for everyone’s attention whose thoughts were probably 10 minutes ahead along the same route to St. Mark’s Square. One topic that is always covered in anything that we’ve read about visiting Venice is the crowds and how to avoid them. One idea was to go in winter when the fog and rain keep everyone away (including us), don’t go on weekends, and arrive just as museums open, at lunch time, or just before they close if you are given a grace period to stay once the doors are shut. We had great luck being there during the week, at opening times, and with a Museum Pass that let us skip the ticket entrance lines. First stop was the Doge’s Palace that I saw described as grand and lavish, which it genuinely is. Built in the 12th century to impress everyone entering its walls, the staircases, archways, and gold vaulted ceilings continue their job today. 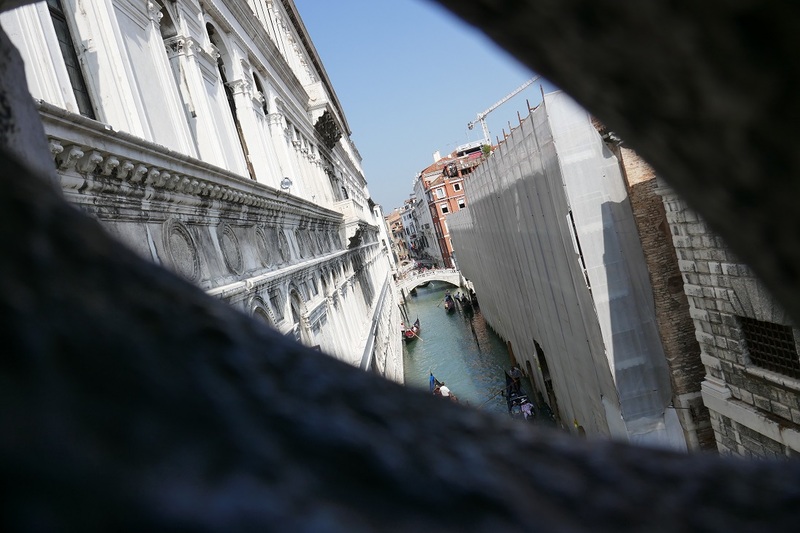 The Prigioni prison across the canal is connected to the palace via the Bridge of Sighs referring to the sound that just-convicted inmates reportedly made as they gazed out on the canal below as they were escorted to their cells. Conveniently next door to the palace is what was once the doge’s private chapel although I don’t know if that word applies to a building big enough for the ceiling and interior walls to be covered with over 4000 square meters (43,000 square feet) of golden mosaics and other Byzantine works of art. Most of the interior is dimly lit but the altar could shine on its own, constructed of gold in the 12th century and later embellished with 2000 gems to add that extra bling. 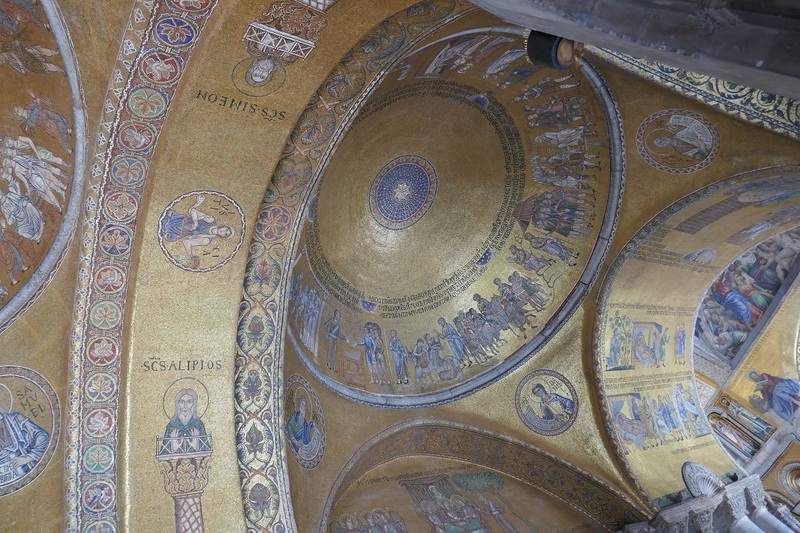 Although it’s free to enter what is now known as St. Mark’s Basilica, we opted to buy an online ticket that allowed us to avoid a long waiting line and enter at the time we selected. By the time we exited the Basilica, the crowds that we had avoided up to that point were in full force. We walked by café after café full of boisterous tourists and passed through the impressive shadow cast by the nearly 100 meter (328 feet) tall reconstructed 9th century watchtower, St. Mark’s Campanile, on our way to the palace Ca’ d’Oro. If time had allowed, I wanted to take a detour to see what showed up on our map as “Church of Curvaceous St. Mary” but that will have to wait for a return visit. 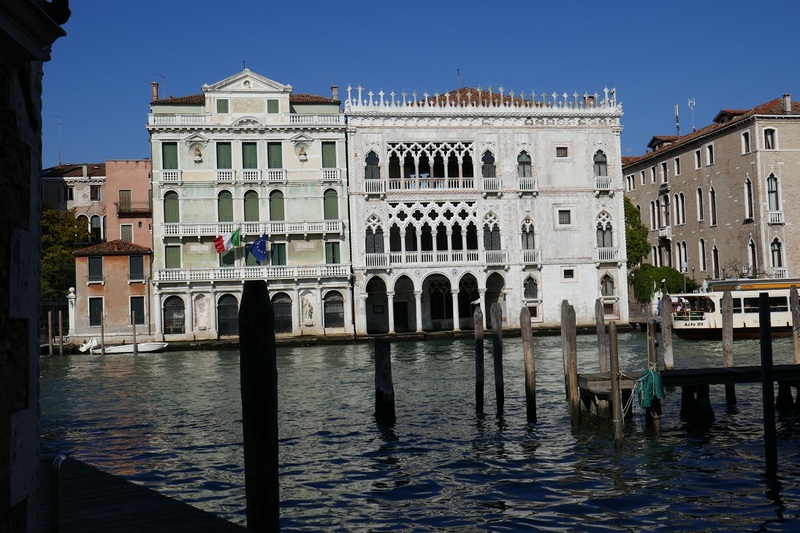 Now an art museum, Ca’ d’Oro has been restored to show how wealthy 15th century Venetians lived. What appears at first glance to be lace on the exterior of the building is actually finely carved marble that was once covered in gold. 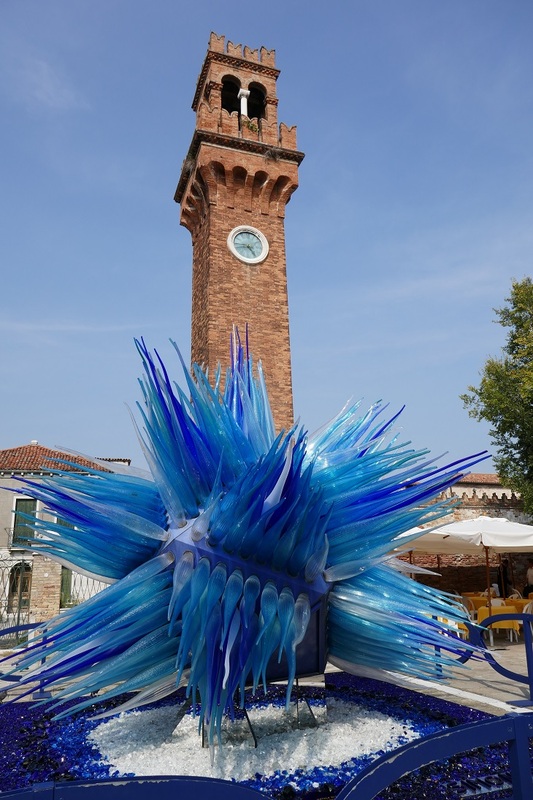 It was time for island hopping and given that the city is made up of 118 of them, we went with two names that we recognized, Murano for glass and Burano for lace. 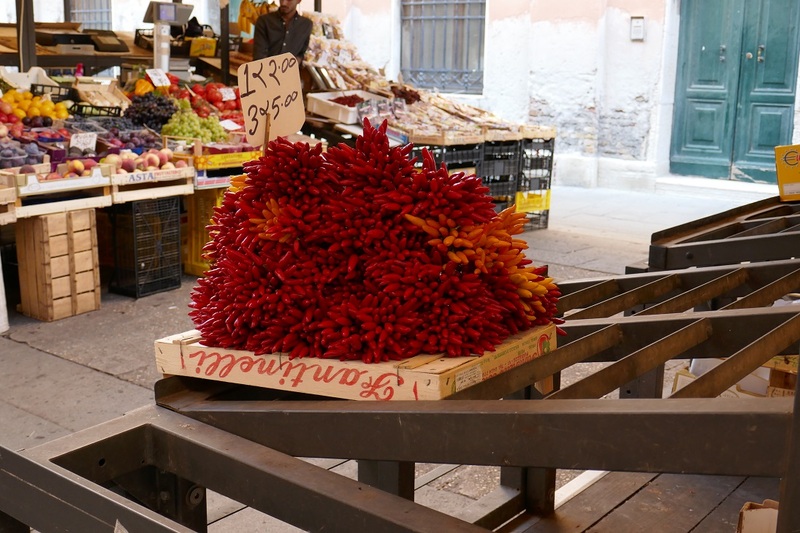 Legend says that in 1291 the furnaces were moved away from the center of Venice for fire safety but it could have also been to maintain glassblowing secrets that brought lots of money to the area. Arrivals of every vaperetto are met by employees of shops/factories trying to entice you into their businesses but we just walked around them and wandered the canal sides looking into what seemed like an endless row of displays stocking an equally endless variety of blown glass. Our pass included entrance into the 17th century Palazzo Giustinian that now houses a huge collection of Venetian glass from Roman times to the present. Also on the pass was the lace museum in Burano so we took the next departing boat there to find a fishing village where the houses are all painted different, bright colors. 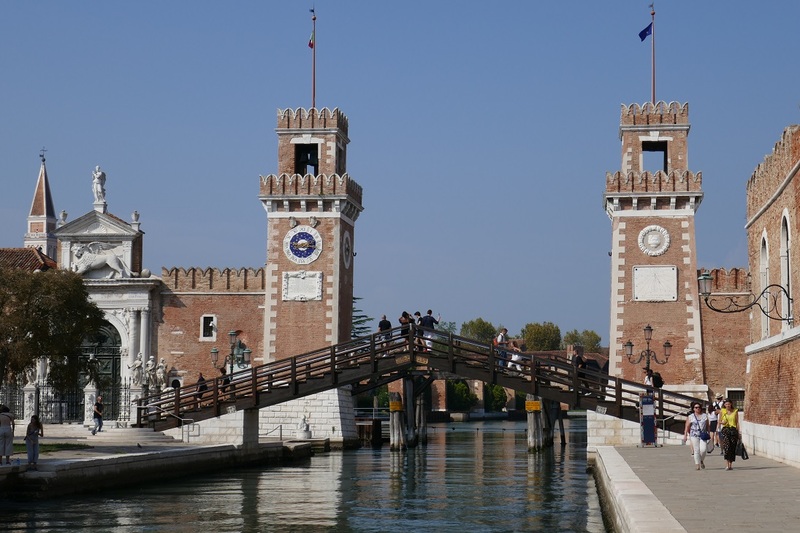 Back on the mainland (not really, but at least these islands were all connected by bridges over the canals) we went to the Arsenal, the shipyard founded in 1104. I read that at times there were 16,000 people working there which might explain how they were capable of turning out a sea-going ship in one day. While on that same side of the Grand Canal we also stopped into Santa Maria dei Miracoli which is supposed to be the locals’ favorite church in which to be married. Begun in 1481, it took only 8 years to construct including covering the exterior and interior walls with inlaid marble that was matched to create the patterns of circles, octagons, and other geometric shapes. Before we left for the train station there were two other historic sites near our apartment that I wanted to see. 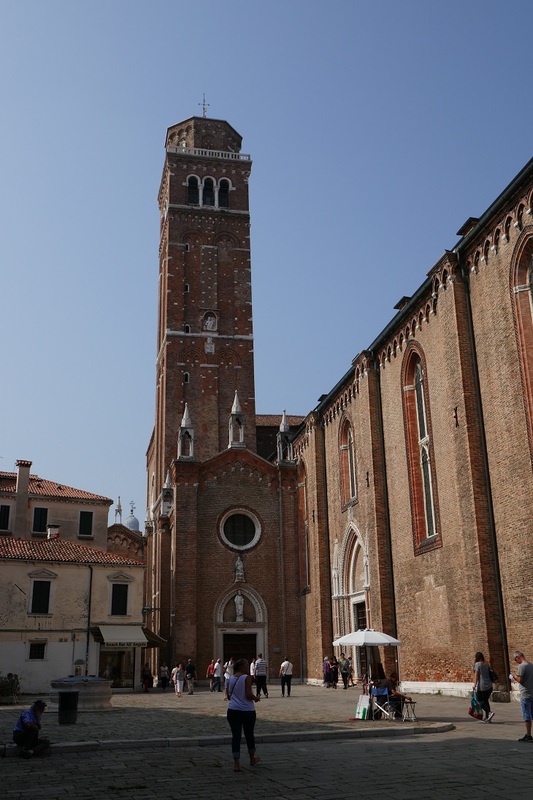 Around 1340 the Franciscans started building Santa Maria Gloriosa dei Frari that boasts the city’s second tallest campanile at 80 meters (262 feet) plus a wooden statue of St. John the Baptist carved in 1451. When we visited Lyon last year we discovered the importance of silk to that French city’s economy and the costume collection at Palace Rezzonico highlights the strong competition that Venice provided through the 18th century. So vital was this trade that during wartime, ships bearing silk were given safe passage to ensure Italy’s dominance in the clothing industry continued. How appropriate to end our visit to this city called “La Dominate” here and take the train to one of the world’s fashion capitals, Milan. Observations—Almost everyone we encountered spoke a minimum of Italian, French, and English. Most restaurants add a service fee to the bill. Before agreeing to a suggested starter, wine, etc. verify with the server the price you will be charged. The fixed-price menu, although typically displayed in 3 parts, is only 2 courses; the 3rd part is not dessert but only the side dish that will come with the 2nd course. A 30-minute gondola ride is 80 euros during the day or 100 euros at night. Posted on October 21, 2018, in Life in France, Travel in France & beyond and tagged Americans in Carcassonne, Public transportation. Bookmark the permalink. 4 Comments. Very nice and interesting! I’ve never been, because as you say its so crowded but will definitely have to cross it off my list. Our neighbors who enjoy returning to Venice each year travel there in November or January to avoid the crowds. Wow, sounds like a complete sensory experience. 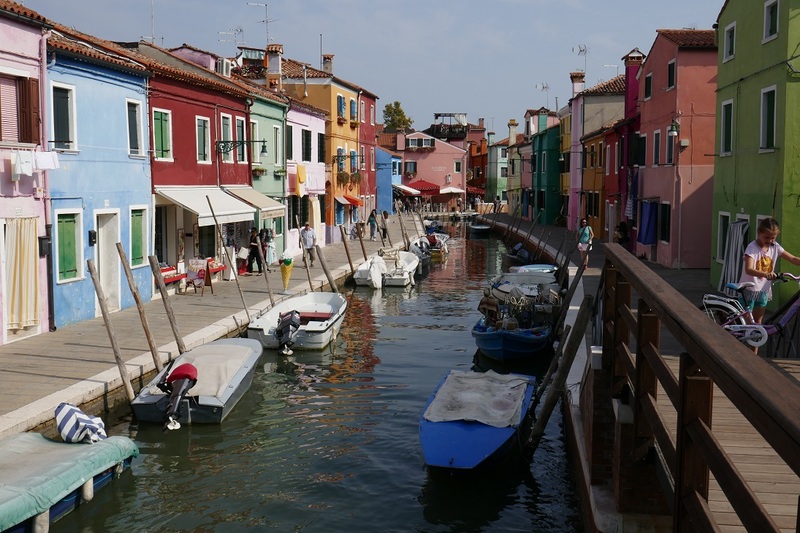 I loved Venice but we did not take the time to visit Murano or the other island. I loved standing and looking over the Rialto bridge! You certainly seem to have seen it all! The crowds were not too bad when we went in October about 5 years ago and it didn’t rain so we were lucky!